← October 2 – To sky, to earth, to sun, to moon. October 4 – No added saturation just incredible colors! If you are a new reader to my blog you may not realize that my images are images captured and created in the past week. So I am challenged on my day off to come home with a couple of photos worthy of an audience. If not, I eke out a few hours during the week to follow a local creative idea. Fortunately, with my iPhone, I have access to a pretty good camera all the time. Even on busy days, cracks in the sidewalk or peeling paint designs on fences or rusting car details can challenge me to take a few minutes off for the sake of capturing a blog-worthy image. Sometimes the captures in one week are just so diverse and rich that I want to continue to share them with you for a little while longer. That is what you have here. A few weeks ago the colors in certain locations of the Eastern Sierra were just beginning to turn, and, in others, were well into their most magical stage. On the trails, I met a couple of former Photochrome members I hadn’t seen in a long time, and they told me they had seen better color in other years. I can’t imagine that. 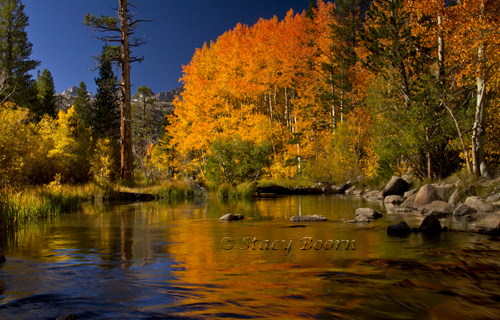 First light on the yellow and orange Aspens lining a creek near Lake Sabrina at nearly 8,000 feet gave them surrealistic neon glow. No added saturation to this image, really! Incredible colors. So often it is said that photography is about being in the right place at the right time. Add composition and photographic techniques to that equation and I am sold on it. I find the details as beautiful and emotive, as worthy of praise and presentation as the grand scenes. Fallen leaves scatted in piles or individually sharing a rock with another also tell the story of the change of seasons and the ancient patterns of the earth’s rotation and history. When water takes on the colors of those it nourishes a symbiotic symphony of hue and texture step into center stage. Reflections will extend closer to you the lower to the ground you get. That is why you will often see me sitting at the edge of a stream or lake with my camera kissing the earth. Touching the earth, getting one’s hands dirty, and smelling the foliage beginning to mulch enhances ones experiential spiritual journey. Getting up from the ground is another kind of experience, but we won’t go into that! The fall colors are like the ribbons mothers put into their young daughters’ hair to give the already beautiful girls a special persona. We outgrow our ribbons, but not the earth. Her ribbons of color are reminders that Mother regenerates herself every day, every year, and in every encounter. Images: Conway Summit (A Panorama made with 7 vertical images), Two Fallen Leaves, Bishop Creek at Lake Sabrina (24 mm lens), and reflection in Lundy Canyon Beaver Pond. 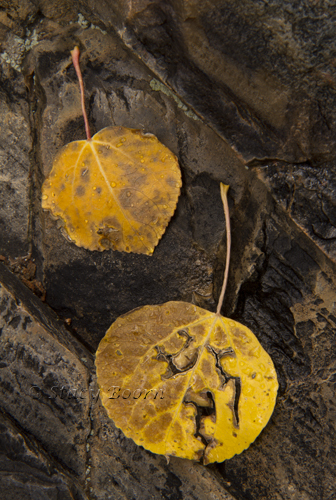 This entry was posted in Weekly 2 and tagged Aspen, Bishop Creek, California, Conway Summit, Eastern Sierra, Fall, Fall Colors, Lake Sabrina, Lundy Canyob, Stacy Boorn. Bookmark the permalink.